Anti-art is the definition of a work which may be exhibited or delivered in a conventional context but makes fun of serious art or challenges the nature of art. A work such as Marcel Duchamp's Fountain of 1917 is a prime example of anti-art. It is a Dadaist work of art. 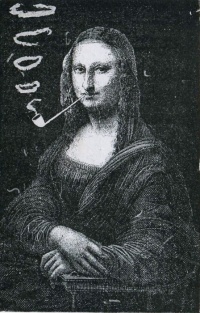 Much of Dadaism is associated with the quality of being anti-art. While the Dada movement per se was generally confined to Western Europe in the early 1900s, anti-art has a wider scope. Since then various avant-garde art movements have a position on anti-art and the term is also used to describe other intentionally provocative art forms, such as nonsense verse. The intention is to make the territory of art contested and difficult and is therefore a locus of class struggle in bourgeois culture. Mail art, for example operates outside the official art world and is sent from artist to artist. Exhibitions and publications of mail-art are also often arranged outside the art world. The Stuckist painters claim to make "Anti-anti-art." Beginning in Switzerland, during World War I, much of Dada, and some aspects of the art movements it inspired, such as Neo-Dada, Nouveau réalisme and Fluxus, is considered anti-art. For everything that art stood for, Dada was to represent the opposite. Where art was concerned with traditional aesthetics, Dada ignored aesthetics at all. If art was to appeal to sensibilities, Dada was intended to offend. Through their rejection of traditional culture and aesthetics the Dadaists hoped to destroy traditional culture and aesthetics. Because they were more politicized, the Berlin dadas were the most radically anti-art within Dada. In 1919, in the Berlin group, the Dadaist revolutionary central council outlined the Dadaist ideals of radical communism in their tract "What is Dadaism and what does it want in Germany?". Beginning in 1913 Marcel Duchamp's readymades challenged individual creativity and redefine art as a nominal rather than an intrinsic object. Originating in Russia in 1919, constructivism rejected art in its entirety and as a specific activity creating a universal aesthetic in favour of practises directed towards social purposes, "useful" to everyday life, such as graphic design, advertising and photography. In 1921, exhibiting at the 5x5=25 exhibition, Alexander Rodchenko created monochromes and proclaimed the end of painting. For artists of the Russian Revolution, Rodchenko's radical action was full of utopian possibility. It marked the end of art along with the end of bourgeois norms and practices. It cleared the way for the beginning of a new Russian life, a new mode of production, a new culture. Beginning in the early 1920s, many Surrealist artists and writers regard their work as an expression of the philosophical movement first and foremost, with the works being an artifact. Surrealism as a political force developed unevenly around the world, in some places more emphasis was on artistic practices, in other places political and in other places still, Surrealist praxis looked to supersize both the arts and politics. Politically, Surrealism was ultra-leftist, communist, or anarchist. The split from Dada has been characterised as a split between anarchists and communists, with the Surrealists as communist. In 1925, the Bureau of Surrealist Research declared their affinity for revolutionary politics. By the 1930s many Surrealists had strongly identified themselves with communism. Breton and his comrades supported Leon Trotsky and his International Left Opposition for a while, though there was an openness to anarchism that manifested more fully after World War II. In 1956, recalling the infinitesimals of G.W. Leibniz, quantities which could not actually exist except conceptually, the founder of Lettrism, Isidore Isou, developed the notion of a work of art which, by its very nature, could never be created in reality, but which could nevertheless provide aesthetic rewards by being contemplated intellectually. Related to this, and arising out of it, is excoördism, the current incarnation of the Isouian movement, defined as the art of the infinitely large and the infinitely small. In 1960, Isidore Isou created supertemporal art : a device for inviting and enabling an audience to participate in the creation of a work of art. In its simplest form, this might involve nothing more than the inclusion of several blank pages in a book, for the reader to add his or her own contributions. Beginning in the 1950s in France, the Letterist International and after the Situationist International developed a dialectical viewpoint, seeing their task as superseding art, abolishing the notion of art as a separate, specialized activity and transforming it so it became part of the fabric of everyday life. From the Situationist's viewpoint, art is revolutionary or it is nothing. In this way, the Situationists saw their efforts as completing the work of both Dada and surrealism while abolishing both. The situationists renounced the making of art entirely. In 1959 Guiseppe Pinot-Gallizio proposed Industrial Painting as an "industrial-inflationist art". In the 1960s, the Dada-influenced art group Black Mask declared that revolutionary art should be "an integral part of life, as in primitive society, and not an appendage to wealth." Black Mask disrupted cultural events in New York by giving made up flyers of art events to the homeless with the lure of free drinks. After, the Motherfuckers grew out of a combination of Black Mask and another group called Angry Arts. Unless indicated otherwise, the text in this article is either based on Wikipedia article "Anti-art" or another language Wikipedia page thereof used under the terms of the GNU Free Documentation License; or on original research by Jahsonic and friends. See Art and Popular Culture's copyright notice.